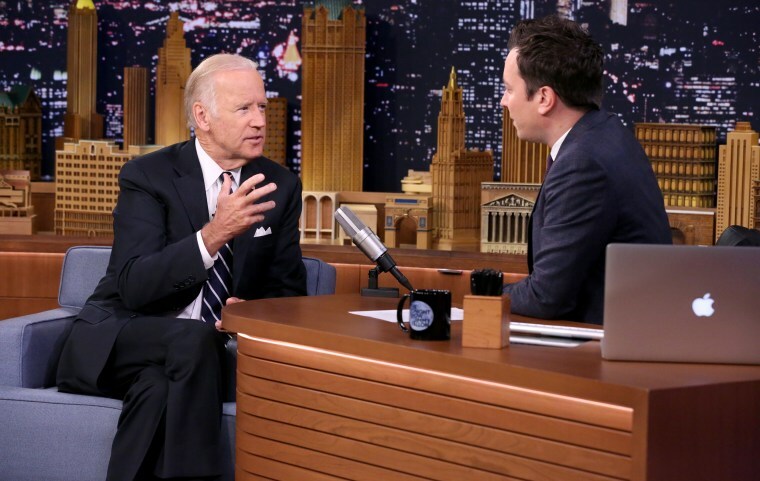 Vice President Joe Biden held nothing back during his Thursday night appearance on "The Tonight Show with Jimmy Fallon," roasting Republican nominee Donald Trump and Libertarian candidate Gary Johnson for their recent comments. Biden also compared Trump’s presence in the debates to Sarah Palin's performance. Afer reciting an Irish poem by Seamus Heaney, Biden took the opportunity to knock down Trump's slogan, "Make America Great Again." "The American people never bend, never break, they are generous. I wish we could stop talking about what trouble we're in. We are in a better position than any country in the world to own the 21st century, we really are." Biden mocked Trump for thinking that he was “smart” for not paying his taxes and called him “callous” for rooting for the housing market crash. Biden took aim at Trump’s former comments about making NATO allies pay their dues for continued American protection in the steamiest burn possible. “I’ve never known of a candidate who knows as little about the world as this man does. I was in Australia with the Prime Minister... and I got a call from the President of Latvia. I flew all the way there just to assure them, the Baltic states, that we the Republicans and Democrats knew that the commitment to NATO was a sacred commitment,” he said. “He thought Aleppo was a dog or something” Biden said on Gary Johnson, who said he had an “Aleppo moment” at a recent town hall meeting when he was unable to name one foreign leader.